This paper addresses the issue of resource offloading for energy usage optimization in the cloud, using the centrality principle of social networks. Mobile users take advantage of the mobile opportunistic cloud, in order to increase their reliability in service provision by guaranteeing sufficient resources for the execution of mobile applications. 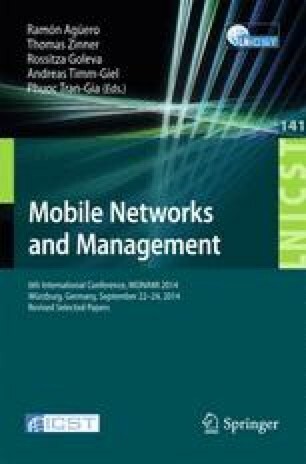 This work elaborates on the improvement of the energy consumption for each mobile device, by using a social collaboration model that allows for a cooperative partial process offloading scheme. The proposed scheme uses social centrality as the underlying mobility and connectivity model for process offloading within the connected devices to maximize the energy usage efficiency, node availability and process execution reliability. Furthermore, this work considers the impact of mobility on the social-oriented offloading, by allowing partitionable resources to be executed according to the social interactions and the associated mobility of each user during the offloading process. The proposed framework is thoroughly evaluated through event driven simulations, towards defining the validity and offered efficiency of the proposed offloading policy in conjunction to the energy consumption of the wireless devices. The work presented in this paper is co-funded by the European Union, Eurostars Programme, under the project 8111, DELTA “Network-Aware Delivery Clouds for User Centric Media Events”. The research is partially supported by COST Action IC1303 Algorithms, Architectures and Platforms for Enhanced Living Environments (AAPELE).